I live in Leesburg, Virginia where I teach high school students in the Agriculture Department. Additionaly, I am self-employed as a horticultural consultant and landscape designer. "Beefriend the Bees!" and "Neither Here Nor There" are children's books I wrote and illustrated available from Amazon (http://www.amazon.com/s/ref=nb_sb_noss_1?url=search-alias=aps&field-keywords=Deborah Chaves&x=12&y=25. Other interests include singing and playing my guitar (also have a CD for sale on Amazon called "Gardening Therapy"); walking my American Bulldog, Cloud and Olde English Bulldogge, Sky; staying active in my local church, and blogging on the www.thedailylily.com. After a long, cold winter and late spring, it is wonderful to see greenery, color and new life again! Come and join us at Monroe Technology Center’s annual Spring Plant Sale where you are sure to find a plant (or a cartload) you will love. Whether you’re looking for an herb, tomato or berry plant from our edible collection, a favorite perennial or annual, native plant or hanging basket…we want to help make your visit enjoyable. 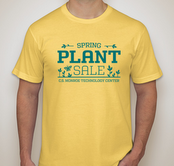 Look for students wearing bright yellow T-shirts that say CS Monroe Technology Center Spring Plant Sale designed and provided generously for us by world famous CustomInk! Or you may find a student or staff eager to help you in a green apron designed especially for Monroe also by the artists at CustomInk! 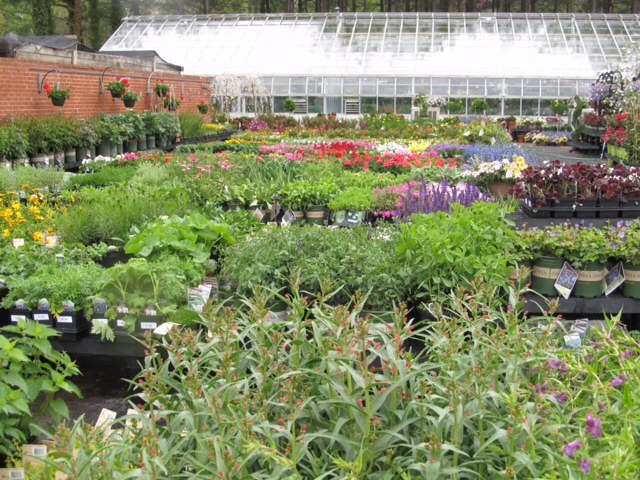 We will have trees, shrubs, aquatic plants and over 600 hanging baskets to choose from so come early for best selection. Hours are Wednesday, April 30, 10am-8pm; Thursday, May 1, 10am-6pm and Friday, May 2, 10am-5pm. 715 Childrens Center Rd, Leesburg, VA.
Oh, and bring your appetite also as the Monroe Culinary Arts Department will be selling pizza rolls and lemonade to raise funds to send students to a national culinary competition. “Neither Here Nor There” is a colorfully illustrated children’s fiction book by about a firefly’s jungle adventures and the lesson to be learned from him. It is written and illustrated by Deborah Chaves. The poinsettia is one of our favorite plants at Christmas. Though we may often think of a red one, today breeders have developed many colors and varieties. Colors range from pinks to multi-colors to purples and burgundy with names such as Monet, Ruby Frost, Ice Crystal, Strawberries and Cream, etc. They have even developed one with variegated foliage called Tapestry. With proper water (not over or under, just evenly moist), bright light and temperatures in the 60-75 degree range, poinsettias can grow happily and give you months of enjoyment. You can even get them to bloom next year if you follow some re-bloom guidelines. Fall is a great time to refresh your tired summer garden. Making a few changes can alter your landscape and extend your color beauty. For starters, remove tired annuals and plant hardy winter pansies. They will last through the winter, even bouncing back after winter freezes and snows. Take down your fading summer hanging basket and replace it with a fall mum basket. Cut back spent perennials and add something different such as a new variety of coreopsis, sedum or daylily. Their blooms will last late into the fall. Planting a hardy Belgian mum ensures that you will have fall color year after year. Consider incorporating a winter blooming witchhazel or evergreen camellia shrub into your design. Or simply create a mix of pansies, mum, ornamental grass, pepper and a colorful perennial in a bright new pot and place it on your front step. If you put your houseplants outside for the summer you will soon have to bring them back in if you live in an area like I do that gets frost and temperatures below 32F. You may notice that they have grown larger or longer (in the case of trailing plants) over the summer and may have overgrown the house space they were previously in. Many can be trimmed back without harming or disfiguring them. And the nice thing is, you can actually do something with many parts you trim off. This would be called propagation by cuttings. In other words, you can reproduce the plant you love, making more just like it. It’s fairly easy and inexpensive.